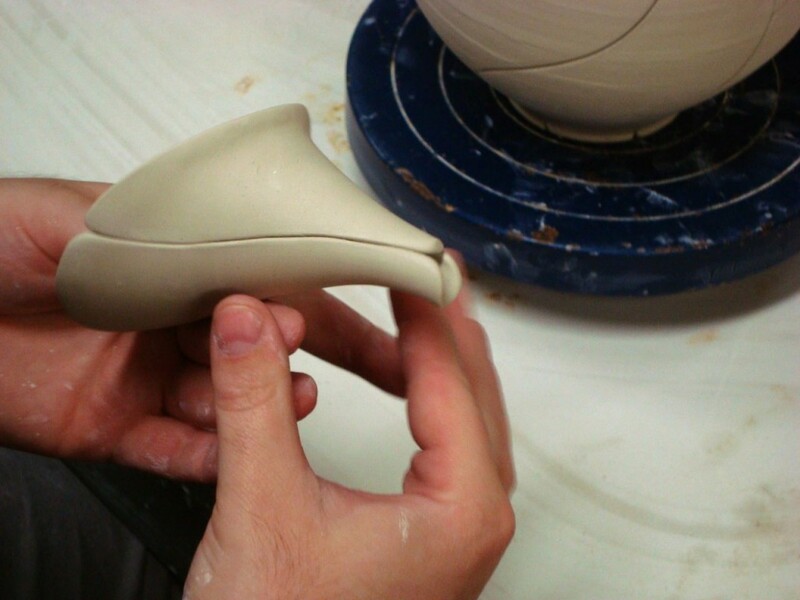 I have been trying to really refine my teapot form lately. It is a very nice challenge to work around. For me, even though it is unlikely anyone would have the courage to actually use it, it must perform exceptionally well. I use the requirements of physics to direct my choices. The venturi effect spout shape, a 45 degree angle for drip prevention, a spout tip slightly higher than the interior lip of the body, a handle pulled in close to the body, and a handle-based lid latch are all part of the design. I begin with a leather hard body, which I proceed to dissect in a swooping, graceful pattern. In this new style, I’m going for a cut pattern similar to leaves, both as bunches and as singular detailed forms at the same time, ambiguously bouncing between the two. From the chaos, I make order. Now, to alter the spout. I split it and then stick it back together. I make a built in tea filter, which I drill by hand using a drill bit. I just eyeball it. 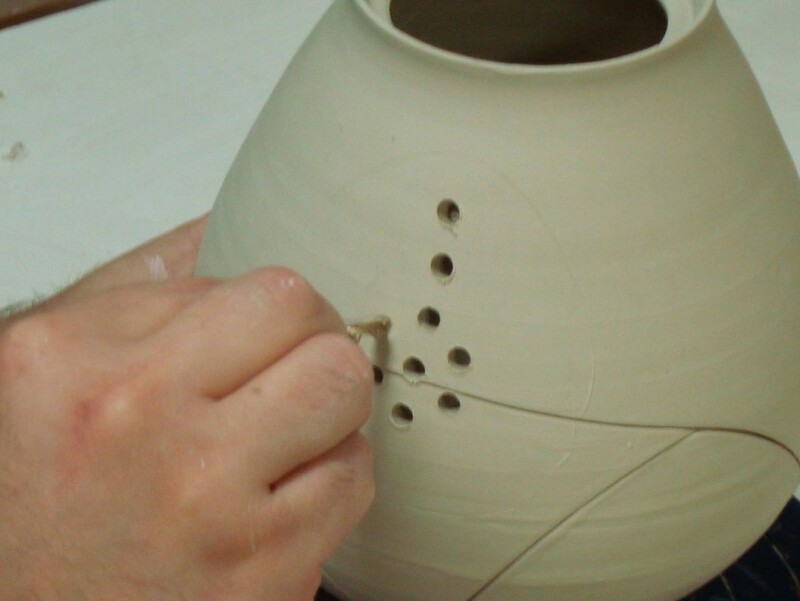 After the holes are made, I rotate the back end of the drill bit to widen and compress the holes. 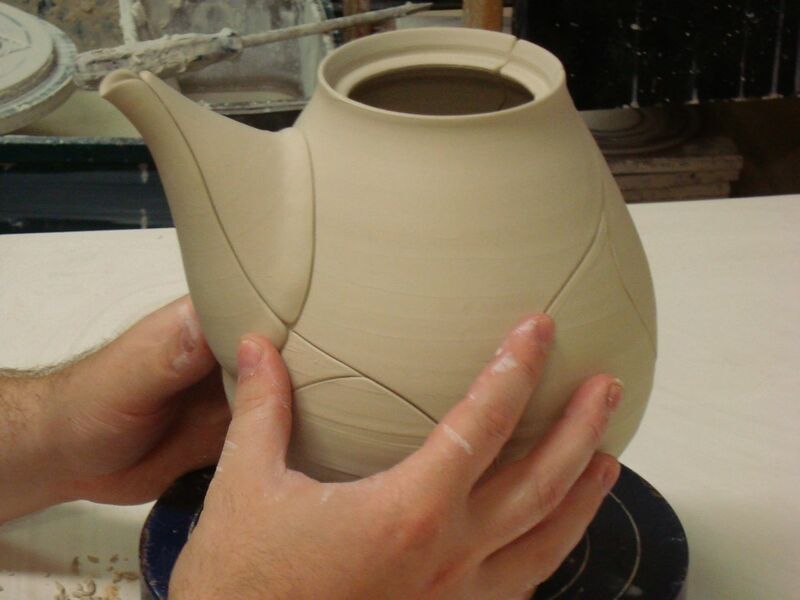 I attach the spout, lining up the split with the line on the teapot form. 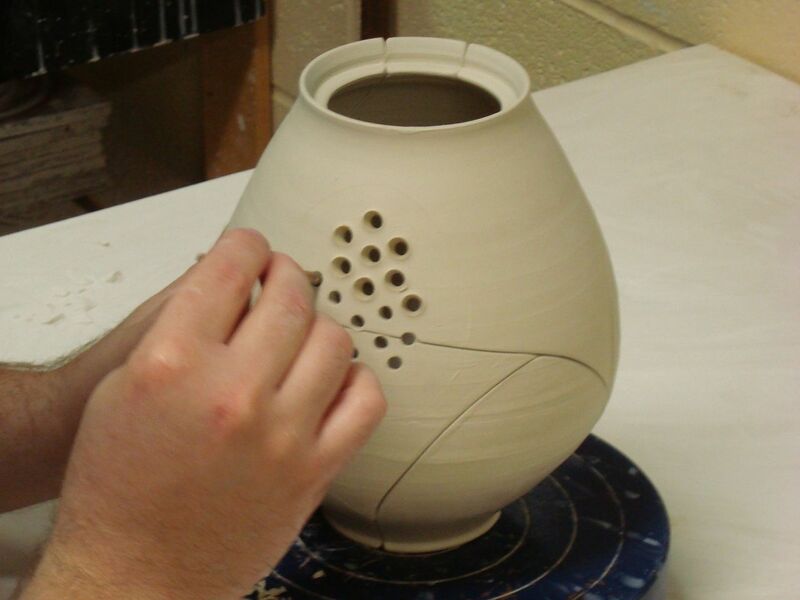 Next, the lid gets it’s knob put in. Finally, a handle is added, here’s the final form. Thanks for checking this out. Your comments and questions are welcome. hi jeff, you’ve outdone yourself… unbelievable! and what a beauty it will be when you’re done. this is almost ready-made how-to article. 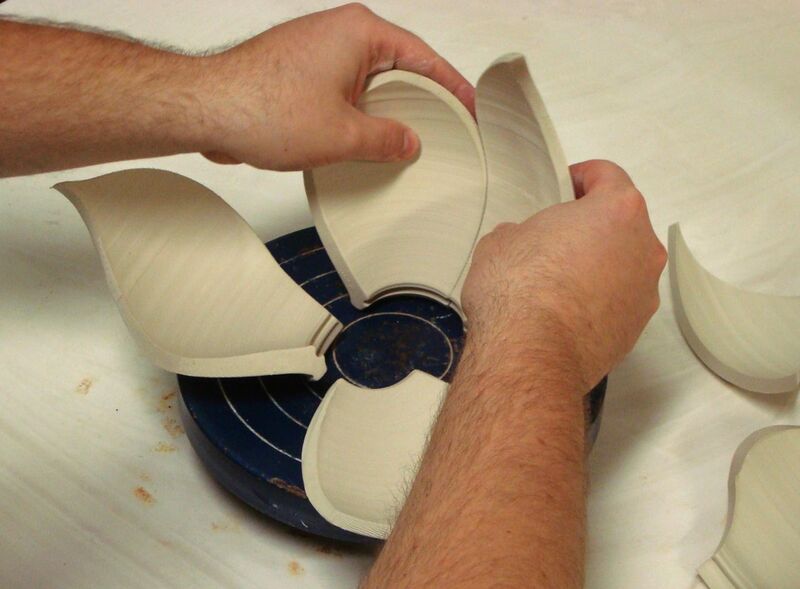 also this type of thing would be good to accompany a show about potters that have OCD-like techniques. Love your work. 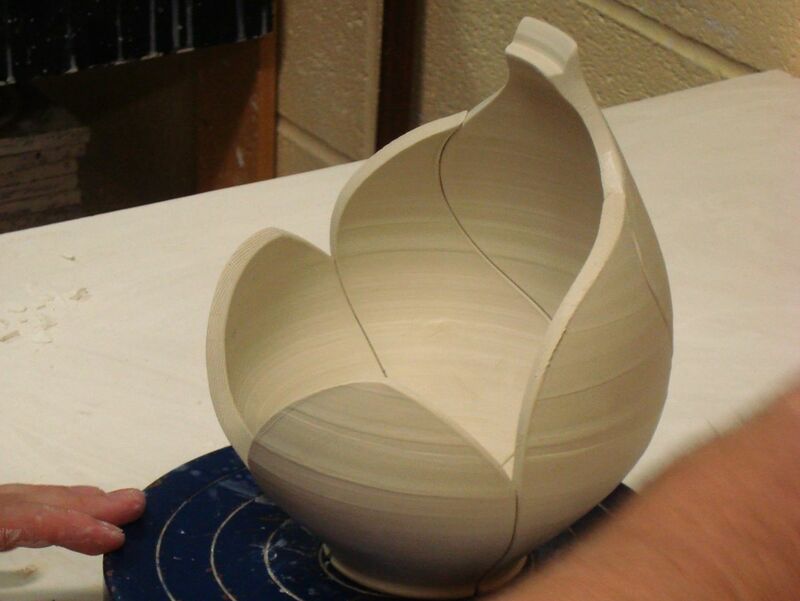 In particular I enjoy the lines of the pieces. Beautiful. Hey, great work! I am wondering how you attach the pieces after you’re done cutting. Is there slip and scoring involved or do you just mash them together? 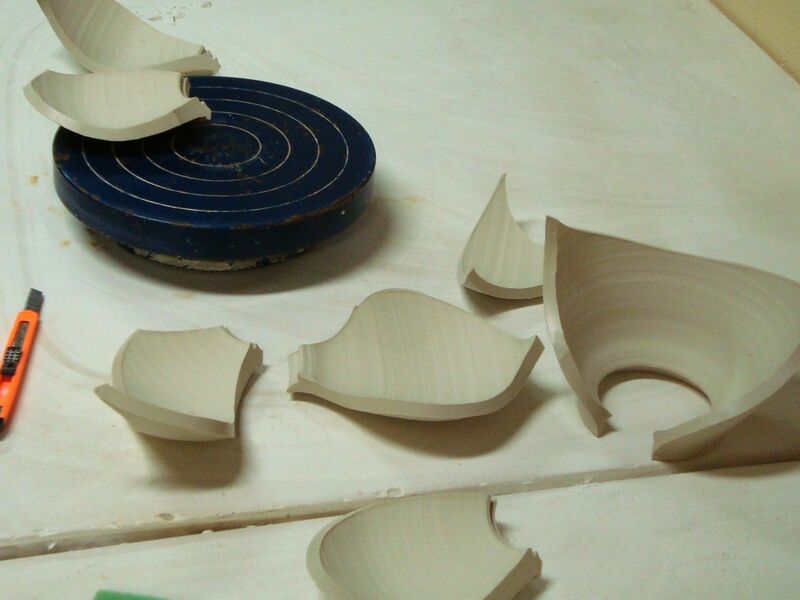 I looked up your site to complement you on the teacup (yunomi?) that was in the recent Lillstreet show. The website’s great, too. 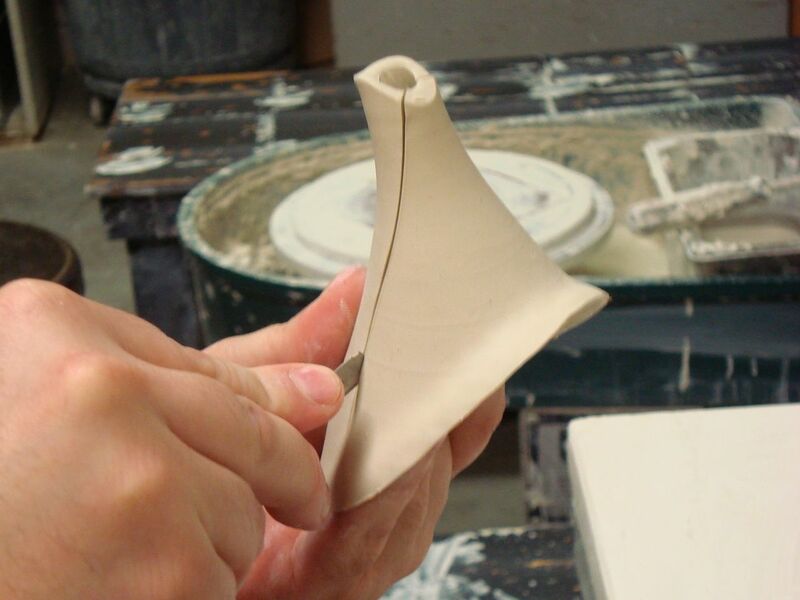 I’m glad to learn about your process, and very excited to read about the manabigama kiln; a few of us at Lillstreet have been interested in that design for awhile now. Thanks! I am really looking forward to doing a show at Lillstreet. We love the manabigama. 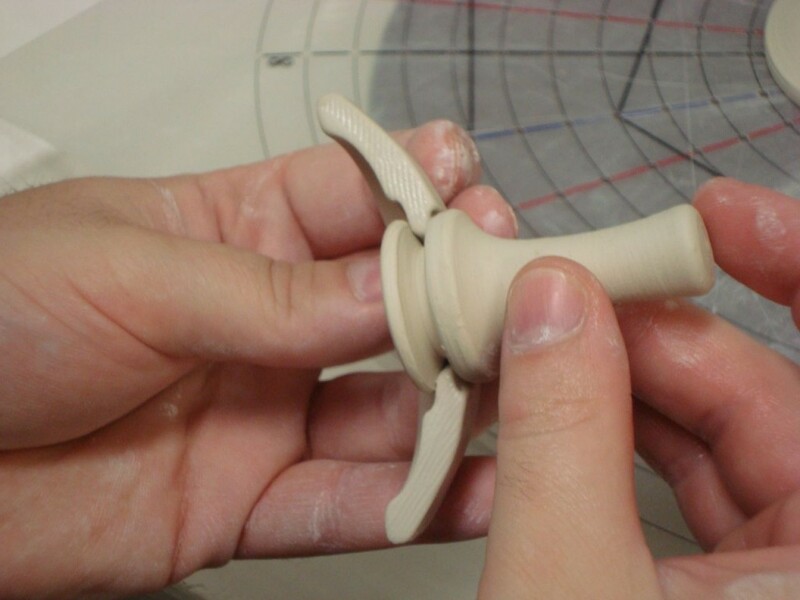 Easy to fire, nice results, and more fun than laborious. It was the perfect choice for our studio. I like the less pronounced lip I think it fits better than the wider edge i have seen on some of your other teapots. I have learned about you and your work only from the internet and really like your work. I think I am going to buy one of your teacup/mugs I just have not decided on which one to get yet. I just thought that i should let you know that all of your online efforts do work and to keep up the good work! Wow, incredible. Thanks for sharing the process. Wow this piece is amazing. 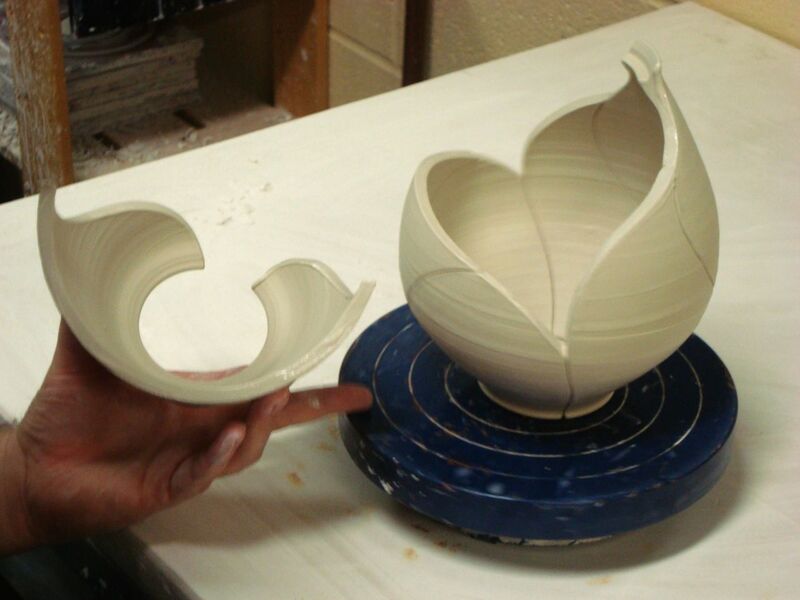 I love beautifully shaped pots, and this one is great. I find the problem with strictly nice shapes is they get kind of boring if just fired as is. 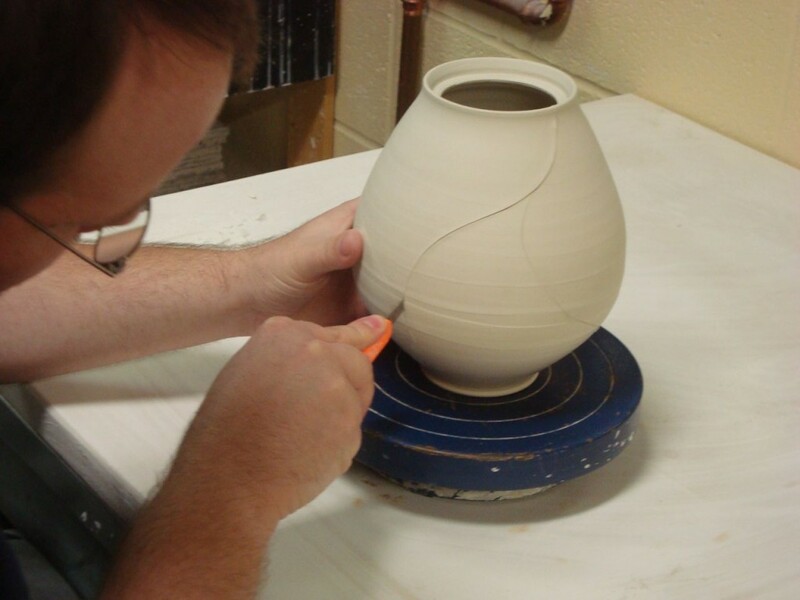 The technique you have is such a nice subtle look which maintains the form while adding so much interest….damn, wish I would have thought of that! Keep up the good work, I’ll visit your etsy site soon. I just wanted to say that I am stunned by your work, so much so that I just wanted to leave a comment saying as much. I love the execution and the form– I hope to own one of your pieces soon. I’m completely inspired and enthralled. Keep going. Your forms are excellent and I really enjoy seeing your process. 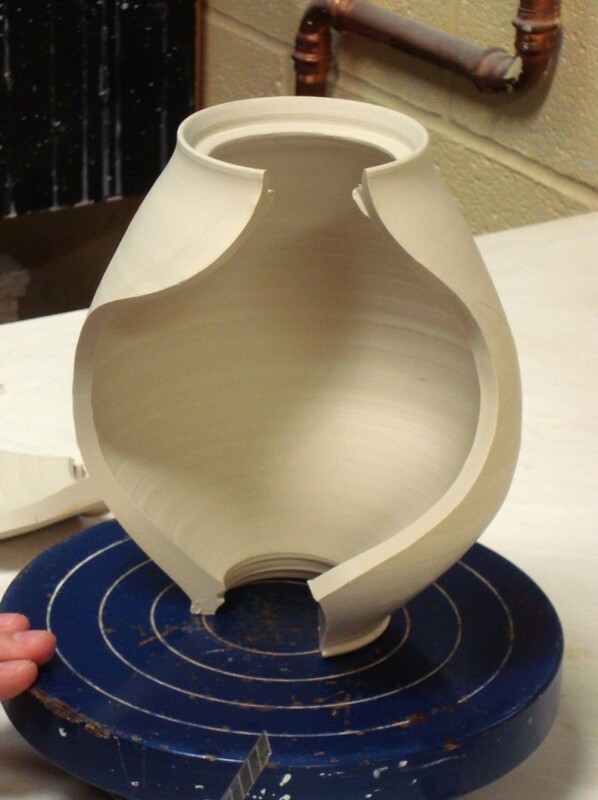 It feels like a roller coaster ride to me when I see you cut through a nicely thrown pot. My heart jumps into my throat every time I see it. Your work is amazing. 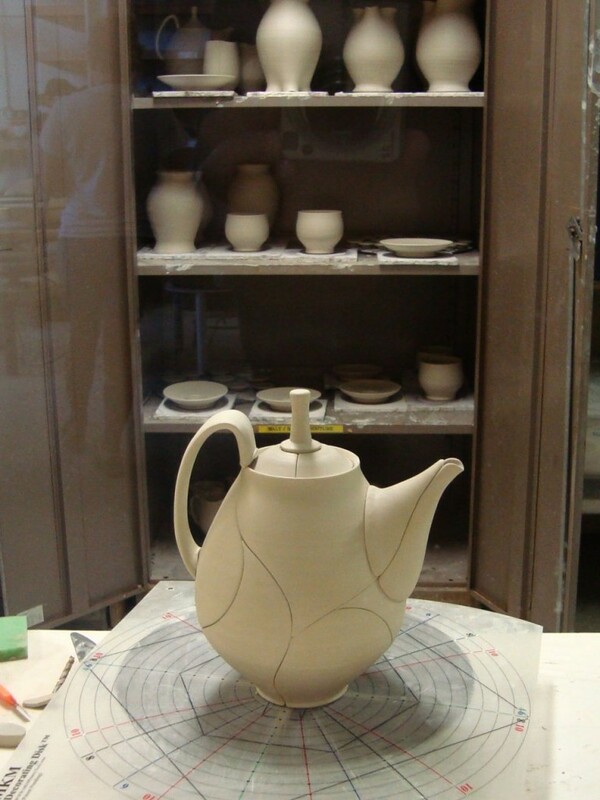 Elegant design of the tea pot and the flowing shapes of the cut lines work together so perfectly. Love it! 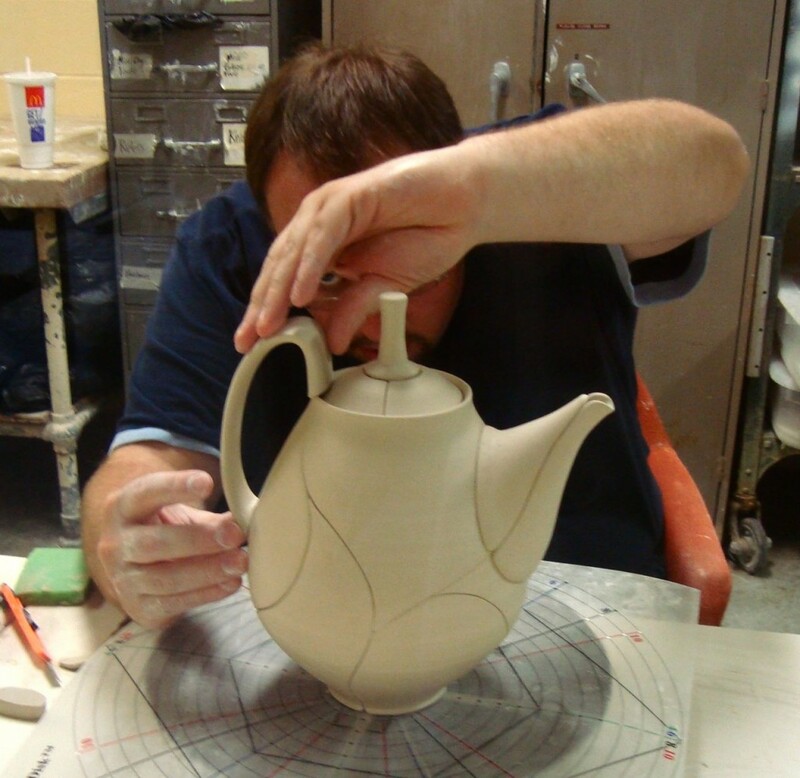 I think each piece of your teapot is a marvel in itself. My husband purchased one of your Green Strip Cocktail Glasses (with an amber base) from the Bray Gallery last month. 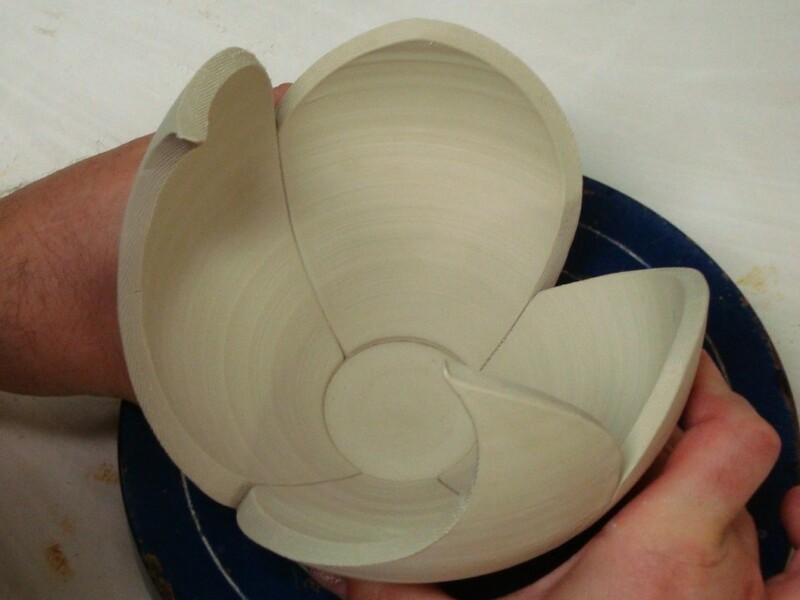 Hobby potters ourselves, we were blown away with the quality, beauty of your work – had no idea you actually cut and reassembled the pieces. Did not know you calledit a Cocktail glass so you will be happy to know it has become his rum glass. LOVE your website, as much as your work – thanks! Jeff, this teapot is incredibly beautiful. I admire your technique, but the graceful lines of the form of this pot are so elegant. Well done! Love it and thanks for sharing.